Jacqui is a positive and confident mother-of-three who loves challenges and adventures. With your support, Jacqui’s life is full of new adventures. With three hungry sons living at home, aged 20, 17, and 14, it’s just as well Jacqui enjoys cooking and baking. She also enjoys busking with her autoharp which she started doing 3 or 4 years ago. Jacqui was just 10 years old when she started to lose her sight due to a brain tumour. She now has peripheral vision, she can see movement, colour and shapes. Thanks to generous support from donors, the Blind Foundation provide many services that help Jacqui and many New Zealanders live independently and confidently. With help from the Blind Foundation Jacqui learnt braille, found employment and has been paired with her amazing guide dog Paris. 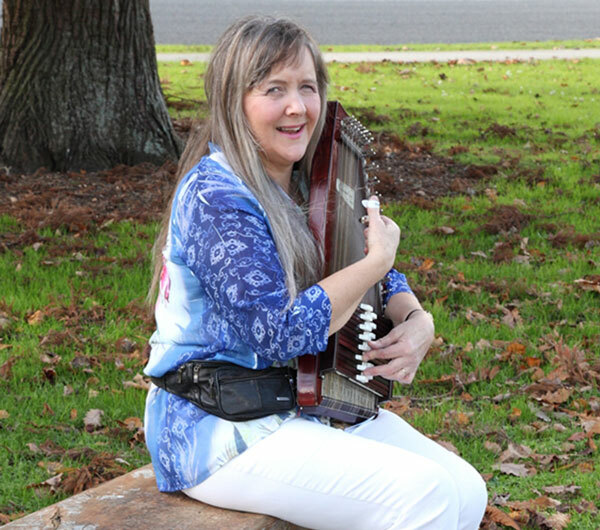 Through theBlind Foundation Jacqui learnt to play the autoharp. Now years later she still plays and has even started writing songs and enjoys busking. Thanks to the generosity of Kiwis like you, we currently reach one in three New Zealanders who are blind or have low vision. Of course, we’d love to reach more. So if you can, please give what you can to make a difference to many New Zealanders living with blindness or vision loss.